The Boker Patriot started with a great premise. A lightweight, affordable utility knife made in the USA with a 154CM blade. Who can argue with that? I for one was excited about the Patriot. But for whatever reason it hasn’t gotten a ton of traction. I say that because the Patriot only got a handful of reviews on Amazon. Hardly any. Contrast that with the Delica 4, which has about 1,500 reviews. Granted the Delica has been around for decades, but still. When a $70 knife released a couple years ago has a grand total of 5 reviews on Amazon, it makes you question its commercial success. But that doesn’t dissuade me. If I bought my knives solely based on what the bright bulbs at Amazon suggested, we would be flooded with Gerber Gear (Bear Grylles edition – yeah! ), M-Tech, and iridescent gas station knives. Thankfully I have too much self-respect for that. Just barely. So when our very own Ben Schwartz told me he had a Boker Patriot for sale, I jumped at the opportunity. But it gets better. Ben is such a generous guy he gave me the knife. Thank you, Ben. I’ve wanted to check this one out for a while. I need to return the favor. The Boker Patriot has an overall length of 7.5″, a 3.375″ blade, and weighs 2.11 ounces. It’s a great size for EDC. Light, thin, but full size and uncompromising in utility. And the Patriot is nicely made. All the parts line up. Good fit and finish. A satisfying knife that gave me a good initial impression right out of the box. The Patriot comes with a compressed drop point blade. Low slung and thin, it’s the perfect size for getting under the corner of an envelope, or slicing away at errant packing tape. Despite this you still get some belly and a fine tip. The knife also has a high flat grind and has been left with a satin finish. One thing I noticed is that this blade came screaming sharp out of the box. Sharp enough where I still remember it, and I’ve had this knife at my office for several months now. I use it mostly for mail, but I’ve taken it to task on some other EDC chores. I brought it home a couple weeks ago and have been EDCing it on the weekends. Out of the box sharpness is only a minor facet of a knife review. After all, you are going to need to sharpen a knife anyways, but I noticed it here. And the Patriot has held onto that sharpness for a long time. I’ve been using this knife casually for a few months now, and I have yet to sharpen it. It’s made of 154CM, which is a nice steel, especially at this sub $75 price point. Excellent stuff. It’s got a fine grain structure and takes a great edge. For regular duty EDC chores 154CM will hold strong for a good while. So the blade and steel are both excellent. Perfect for daily carry tasks. The Patriot’s handle is comprised of glass filled nylon handle slabs, a plastic backspacer, and a stainless steel back lock. The handle is held together with high quality torx fasteners. This knife is linerless, so I wouldn’t use it for anything but cutting chores, but it feels remarkably solid. They offer the Patriot in a number of colors, including standard black. Orange is a good change of pace. There is no losing this knife if you drop it on the forest floor. I know some will poo-poo the Patriot due to its plastic handles, but I don’t mind a plastic handled knife when it’s done right. And here it has been done right. The plastic pieces have been finished nicely. No gaps, no extra plastic left over from the molding process. It doesn’t feel cheap. And the satin hardware contrasts nicely with the matte handle. There is also an unobtrusive lanyard hole for those that like lanyards. In hand the Patriot feels secure. It’s a thin handle, but thanks to some smart ergonomic decisions the Patriot fills the hand and is comfortable to use. First, the handle is relatively thick. Not Cold Steel Voyager thick, but thick enough to provide something to hold onto. Then they have included a couple finger grooves. This can be hit or miss, but here the grooves work perfectly for my hands. A short row of jimping provides ample traction for your thumb, and there is a forward finger choil on the blade if you want to choke up. It’s a small finger choil, but it works. Rounding things out is a high traction triangle pattern on the handle. The end result is that the Patriot is comfortable to use. It feels natural in the hand in both forward and reverse grips. There is a lot of traction, so if you decide to use this for food prep, hunting, or some other messy chore you won’t be disappointed. But the knife is still comfortable thanks to the molded edges. The pocket clip is a standard stainless steel deep-carry clip. It is simple but effective. Spring tension is about perfect. The knife is easy to insert and remove from the pocket, yet it remains securely in place. It’s also swappable for left or right handed tip up carry. It has good tension and is relatively discreet. The Patriot carries easily. It’s a lightweight knife with a sturdy clip, so you quickly forget about it and there is little chance of it falling out of your pocket. I will say that the aggressive texture of the handle can make this a pants shredder. I won’t use this knife with suit pants or slacks, but it’s fine for my $15 K-mart shorts. The Patriot is a thumb stud knife. If you have read my last few reviews you would have thought I forgot about these. Everything is a flipper these days. But the Patriot comes with two thumb studs that appear to have been bolted onto the blade. The thumb studs are prominent and I can flick the knife open with my thumb most of the time. There is a decently strong backspring, so adequate force needs to be applied to pop open the knife. All things equal I prefer the more reliable thumb hole of a Delica over this, but it’s not bad. The action is smooth and fluid. Peering into the handle I can’t see washers, but would be surprised if there were not phosphor bronze washers hugging the pivot of this knife. For lockup we have an old school back lock. It’s actually more like a mid lock. It has a Boye Dent (the little dent on the lockbar release), which makes the knife more difficult to accidentally disengage. Lockup is secure. The blade falls into place with a satisfying snap. There is no blade play in any direction, a remarkable feat given this is a liner-less plastic handled knife. Delicas and Enduras are notorious for up and down play. Cheap plastic lock backs like the Ka-Bar Dozier Folding Hunter often have some play in them. A little blade play isn’t the end of the world, but its absence here goes to show that the Patriot is firing on all 6 cylinders. The blade centering on my knife isn’t perfect. It’s maybe off by a mm. Still “centered” and not rubbing, but not perfect. The Patriot is an excellent mid-priced EDC knife. The market has become so top heavy expensive knives that it has become easy to lose track of more humble offerings like the Patriot. But ignoring this knife would be a shame. It’s a solid design that has been nicely executed with good blade steel. In many ways I prefer the Patriot over the Delica: better blade steel, stronger lockup, and nicer ergonomics. But the Delica is an icon, and I prefer the blade shape and thumb hole on that knife. Still, I can’t help but wonder how the annals of knife history would look if this Patriot was released at the same time as the Delica. Would it be as widely recognized? Who is to say. I think it would have more than 5 reviews on Amazon – that’s for sure! Will the Patriot blow your skirt up like a $400 titanium framelock flipper? Probably not, but this is a knife you can use guilt free on a daily basis. It is easy to carry and does a good job cutting stuff. You won’t cry if it gets scratched up by your keys and loose change. It’s an excellent daily carry tool and I’ve enjoyed having mine at the ready for several months. I’ll probably bring it back to my office after I’m done with this review. It’s perfect for mail, packages, and anything else I need it to do. Recommended. 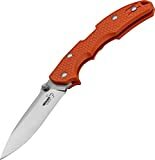 BOKER PLUS USA Folding Knife Steel Blade with Orange Handle, 3.38"
I recommend purchasing the Boker Patriot at BladeHQ or Amazon. Purchasing anything through any of the links on this website helps support BladeReviews, and keeps the site going. Any and all support is greatly appreciated. Thank you very much. I love this knife. Especially the red easy grip handle. Jason, Glad you like this one as well! FYI, the link at the top of the review is to a different Boker. Will, Thanks for letting me know. I fixed it.